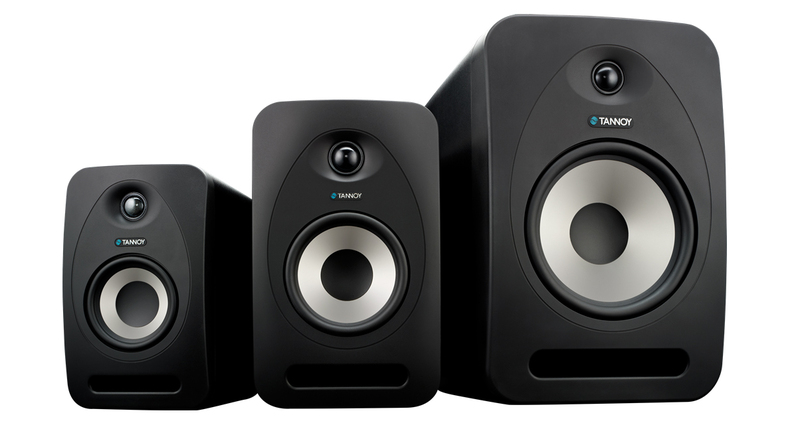 The latest speaker offerings from Tannoy are the company's update to its Reveal line of affordable monitors, built for both project and bedroom studio. 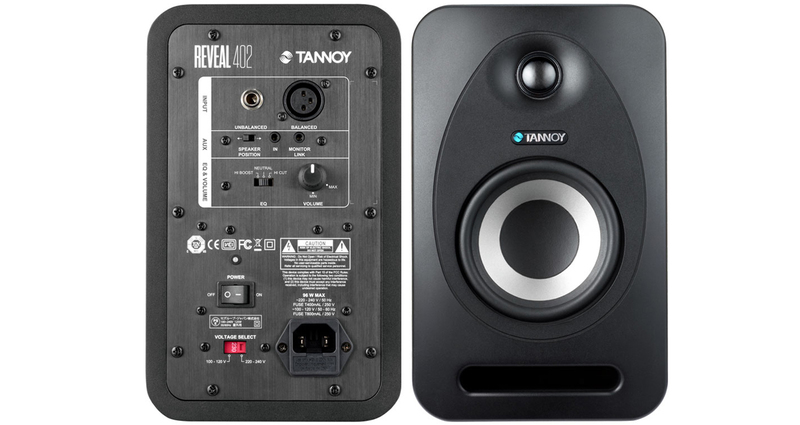 Smart, compact, practical and great sounding, the Tannoy Reveal 402s are a fantastic small home studio / desk speaker, with the best elements of both computer speakers and pro monitors rolled in, and at a realistic price, too. They are a pro studio monitor, only smaller! They look a bit like shrunken KRKs but with white cones instead of yellow, having curved corners. They are front ported, which means they have a slit at the bottom of each speaker at the front for bass frequencies to move through. (This also means that they’re happier close to a rear wall.) They have 4″ woofers and 3/4″ tweeters, and a smart “Tannoy” logo on the front. They come with a bottom-mounted foam pad underneath each speaker. The speakers are individually sold and set up like “real” monitors, so that means each pair is essentially two identical speakers, a small switch on the back letting you indicate whether the speaker is to be placed on the left or the right for correct stereo (more about that in a bit). On the back we also find inputs for XLR and TRS balanced audio, a subtle three-way switch for tweaking the treble, a volume control, standard three-pin socket for power, fuse/holder, power switch and voltage selector. So about that stereo switch: There’s a rather clever feature that aims to bring a bit of the functionality of cheaper computer speakers to this design: namely, a socket for running a link cable between a pair, and a stereo 1/8″ jack socket for plugging in an MP3 player or (far more likely) your computer. This is a good compromise between master/slave speaker set-ups and pro monitors; it means you can still run a mono cable from each channel of your DJ controller or mixer to each speaker independently via the balanced inputs, but also have your desktop, laptop or other secondary input wired in easily. On plugging in and powering up, a bright blue power LED lights around the back to let you know they’re active; this is quite nice as it casts a subtle blue light behind the speakers rather than shining brightly in your face. The Tannoy Reveal 402 may be the smallest in the family, but it doesn’t skimp on any of the EQ and input features of its bigger brothers. We do a lot of our filming and teaching in a big studio where we use huge KRK speakers, but the truth is that I do a lot of my day-to-day work (and that, of course, means day-to-day DJ practising, gear testing and simply writing while listening to music) in my home office, which is basically a broom cupboard! So anything I listen to music on in here (for it’s here where I’m writing this now) has to be small and sound great. As I say, I’ve always plumped for the M-Audio Audiophile AV40s as they’re basically well built, tiny and pack a nice (if slightly boxy) sound for their size, but mine started to get a scratchy volume control and a weird connection issue where one would intermittently turn on and off, so I kind of (ashamed to admit it!) have recently reverted to headphones and / or my iMac’s built-in speaker – terrible state of affairs for a music journalist! So when these arrived for review, I was excited to see the difference they could make to my day-to-day work. While quite deep (the size is actually 9.5 x 5.8 x 8.4in), they are still small, so after a bit of desk rearranging I managed to squeeze them in, angled slightly inwards (Tannoy recommends having the tweeters at ear level; I have to put up with them – as I suspect many will – slightly below that). I have been using them to test DJ gear (the Traktor Kontrol S8 in the last week, which has a lovely sound card and which sings through these), as well as having streaming music on the go while working, and in all circumstances they’ve sounded awesome, a huge, huge step up from the M-Audios as you might expect. While the first thing you notice is the deep, warm bass and the sheer volume, they soon reveal a very easy to listen to, smooth sound; engaging and true, but not harsh or too demanding of good positioning. The little high frequency tweak switch is nice especially for really low listening when it’s nice to add a bit of “sparkle” back into the sound by moving it to its boost position. The only downside is that there is a very slight hum/hiss when plugged in; could be the extreme proximity to my 27″ iMac monitor, and I have to say I can’t recall ever not hearing some version of this “idle” noise when budget near-field monitors are set up in such a way, so I guess it just comes with the territory (the spec reveals they’re not magnetically shielded which may be the issue). Not at all noticeable when music is playing, but enough to mean I turn them off when not needed. One thing that’s nice about them is that they fill the small office pretty well, so if I do move around a little in my chair the sound remains pretty good due to this wide dispersion. Tannoy says they are specifically designed as “near field” which means anything from 75cm to 3m from the listener (the former in my case), but they’ll at a push work fine as your only pair of speakers, if the experience in my home office is anything to go by. And yes, they’re loud! They are quoted at 25W LF and 25W HF, but I never put much stock in the numbers, and instead go by the practicalities: Here, I have the volume controls on the rear of the units set to less than half, and with a DJ controller pushing just into the red, or the headphones output from my Mac on about two-thirds, they are more than plenty loud enough. When pushed, they hurt your ears long before they start to distort (something I didn’t test), so we can safely say they pack enough punch for any situation where you need small monitors in the first place. Despite their size, the Tannoy Reveal 402s pack quite a punch, easily filling the home office with well-reproduced sound without breaking up. Us digital DJs are a particular bunch: We tend not to have big, custom-built studios in rooms we don’t use for anything else, and indeed many of us are drawn to digital DJing in the first place through its convenience, through the fact that we can fit our hobby into our busy households by having easy-to-stash gear and smartly chosen complementary equipment that doesn’t take up the whole room. At the same time, we dabble in production as well as needing to practise our DJing, so we’re deadly serious about getting the best sound possible within those constraints. Also, finally, most of us aren’t made of money, so that enters into the equation, too. The Tannoys fill a particular spot for DJs, which makes them well worth considering. They are small yet high specified; good for recreational as well as professional use. 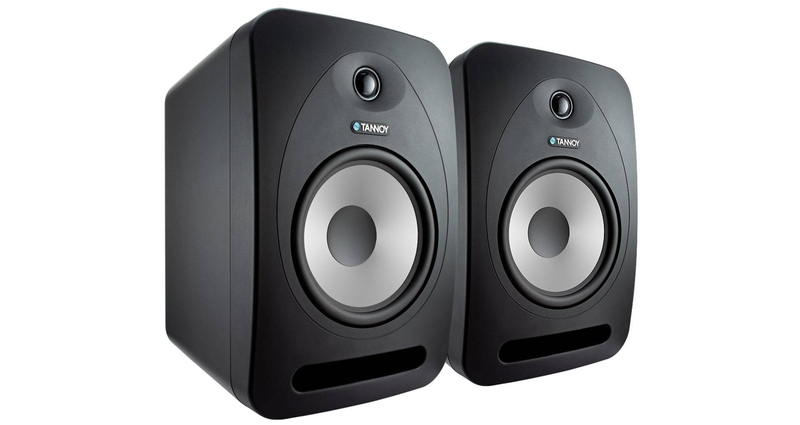 They cleverly take some of the best parts of studio monitors (true, clear sound, individually amplified, active crossover) and give a nod to ease of use in the home (single socket to plug in your computer or MP3 player). And they don’t cost the earth; at US$119 each they’re definitely a step up from the aforementioned M-Audios, but really if you’re looking for a decent home digital DJ set-up, this is the minimum you should be looking to spend on whatever you choose for monitoring; anything else is going to have you wishing you’d spent a bit more in the first place, I feel, or reaching to add a subwoofer later on at more expense (you certainly won’t want a subwoofer with these, the bass is plenty strong enough). These speakers are part of a bigger family (there are 502s and 802s as well), but I suspect this is the one that’ll have our readership people most excited; it’s certainly the most original of the three, and we highly recommend them.